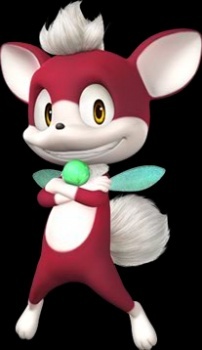 Chip (Light Gaia) is a small, burgundy colored, brown-eyed flying animal who debuts in Sonic Unleashed. He has a white tuft on the top of his head, similar to his tail, has tiny translucent turquoise wings on his back and a green bauble on his neck. He was first seen in a Japanese manga adaption of Sonic Unleashed. In this, Sonic wakes up after Dr. Eggman's laser gun mutates him into a monstrous version of himself. Chip is seen lying on the ground nearby, and Sonic attempts to make sure that he is okay. Chip flies away, afraid at first, though he soon realizes Sonic is good.